Pinot Gris is likely one of the first of the four Alsatian noble grape varieties wine connoisseurs think of. 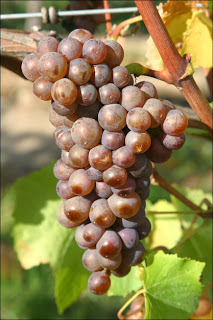 Although it is the third most planted varietal in Alsace, many consider Alsace to be the benchmark of Pinot Gris wines. Can an Okanagan Pinot Gris hold up against a strong Alsatian contender? My husband and I put it to the test this week. Also known as Pinot Grigio in Italy and Grauburgunder and Rulander in Germany and Austria, it was once known as Tokay-Pinot Gris in Alsace, but the Tokay part of the name was dropped for good in 2007. The grape was first documented in 1711 when it was found growing wild in a garden in Baden-Wurttemburg, Germany. Other legends suggest that the grape was brought to Hungary from France in the 1300s, and returned to Alsace from Hungary in the 1500s. What makes it unique is the colour of the grapes; the skins tend to be grayish-pink in colour unlike other white grapes. Some might say that what makes Pinot Gris unique is a musty, smoky aroma that complements the aromatic flavours of the wine. The grapes generally produce wines that are low in acidity and higher in alcoholic content with flavours of stone fruit, melon and even butter when aged. Pinot Gris is well known for making sweeter, late harvest wines when able to reach full ripeness. I pitted a 2011 Laughingstock Pinot Gris against a bottle of 2011 Pfaffenehim Pinot Gris for this week's battle. We started with the BC wine, the Laughingstock PG. We purchased this bottle directly from the winery in 2012 and it spent the last year of it's life in our cool, humid cellar on it's side. The first thing we both noticed was the mouth-watering acidity of the Laughingstock, which lasts well into the long finish. Both intense and complex, the wine showcases a flavour profile that includes lemon, red apple, tangerine and a hint of honey. This wine seemed a little "angry" at us for not letting it sleep for longer, so I recommend this wine be cellared for 3 more years to mellow out the acidity a little bit. It is a youthful wine, but still of good quality. The Pfaffenheim Pinot Gris is off-dry, full-bodied and smooth, with a unique and beautiful bouquet of tangerine, candied ginger, orange blossom and honey. Although not as intense as the Laughingstock, the Pfaffenheim is also complex, well balanced, and very expressive of what an Alsatian Pinot Gris is said to be. Both wines were excellent values at $21 CDN each. I noticed that with both the Gewurz and Pinot Gris tastings, the Okanagan wines showed riper fruit flavours, more mouth-watering acidity and a hint of minerality. Both the Alsatian Gewurz and the Pinot Gris were smoother and a little sweeter. Will these trends follow in the Riesling battle? Stay tuned to find out!